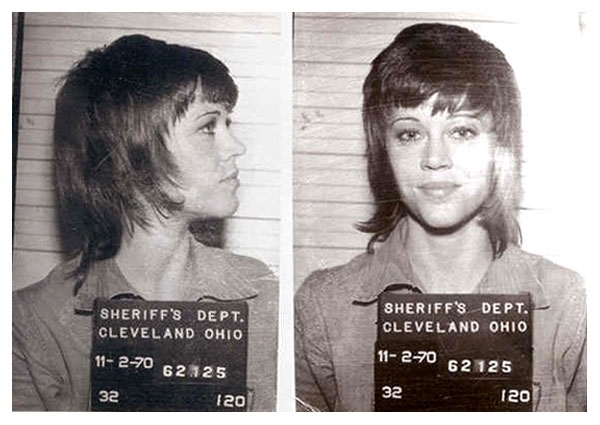 Jane Fonda was arrested in November 1970 for allegedly trying to smuggle a large stash of pills through the Cleveland airport (charges were later dropped). Fonda, arriving from Canada, was detained by U.S. Customs agents after a large stash of diet pills, Valium, and tranquilizers was discovered in her luggage. The actress, then 32, was booked on the narcotics rap at the Cuyahoga County Sheriff's Office, where the above mug shot was taken. Following her release from custody, Fonda was processed and photographed for a separate crime, her alleged kicking of a local cop during the airport incident. That charge, later dropped, resulted in Fonda's famous "clenched fist" pose during her second Cleveland mug shot session. Submitted by vietnamvet on Wed, 2011-05-18 23:03. Submitted by johnyQ on Thu, 2011-04-07 18:23.
hmm Hanoi Jane. Loser she should have stayed there , and with out her dad she never be nothing more then a hag. Submitted by BirdBrain on Fri, 2011-03-18 21:45. She's nothing but an anti-American conspiracy theorist. She needs pills because she's fracked in the head. Get over yourself Jane, we all were over you years ago. Submitted by Timmi on Thu, 2011-04-07 14:53. Submitted by [email protected] on Wed, 2011-02-23 16:05. Submitted by alouden on Wed, 2011-02-16 23:37. All the pills were tested, and came out to all be vitamins, some bottles labeled l, b, and d, which meant those were the vitamins to take for breakfast, lunch, and dinner. Submitted by BudBundy99 on Sat, 2011-02-05 04:13. November 2, 1970 Cleveland, Ohio- Jane Fonda 32, [Klute (1971), Steelyard Blues (1973)] is arrested after kicking a policeman and a customs agent at the Hopkins International Airport. They also charge her with importing some 2,000 tranquilizers and pep pills from Canada. Jane Fonda charges she was going to the ladies room when officers accosted her. Police were concern she was going to flush drugs down the toilet. She was released on a $5,000 dollar bond. Her attorney is Mark Lane, the author of “Rush To Judgment” a popular conspiracy theory book. Last year, Lane represented 18 Black Panthers (“L.A. 18”) for rioting. Back in France, Fonda’s husband director Roger Vadim told the press his wife spent ten hours in jail. He described Fonda as being a vegetarian and she needs vitamins and diet pills. “She afraid to eat,” he said. Jane and Roger have a daughter Vanessa, named after her anti-Semite friend Vanessa Redgrave. All charges were dropped when Jane Fonda proved she had prescriptions for her pills amphetamine, Dexedrine, Valium and Compazine. Fonda sues the police for $100,000 dollars, claiming false arrest. Nothing comes of it. Submitted by roydawgg on Mon, 2010-11-15 02:59. Submitted by Starrman69 on Sat, 2010-09-25 20:48. Submitted by acortenza on Sat, 2010-09-18 01:50.
no way? she was on diet pills and sedatives? for what? and the charges were dropped!? egad- what a world! when will it all make perfect sense?! ahh, ok.